Documentation of REV23 software and services for tattoo & body piercing studios. Welcome to the new REV23 Docs site, the home for our documentation and user guides. Expand your knowledge of REV23 software and services to get the most out of products in your tattoo & body piercing studio. REV23 Docs is currently in preview. We're making changes regularly to our docs and the site. Keep checking back, or let us know if there's a particular topic you'd like to see done. Explore popular topics from our docs. The best place to get started with REV23 Desktop. 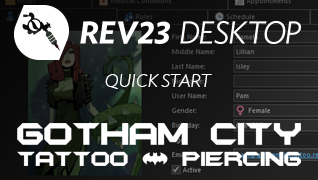 Follow Harley Quinn, Poison Ivy and Catwoman as they open Gotham City Tattoo & Piercing and start using REV23 Desktop. Get help with syncing your device. Having trouble with Cloud Calendar? Device not syncing? Check out this topic. Ensure that you don't lost data during a hard drive crash! Set up automatic backups to an external hard drive today! Blog: Backup your backup. A guide to healthy database backups. Want to contribute to our docs or be notified when we make changes? Follow our REV23 Docs repository on GitHub. Find an issue in our docs or want to send us feedback? Submit a report in the repository.